Background: Pridopidine, a compound in clinical trials for Huntington's disease treatment, was originally synthesized as a dopamine D2 receptor (D2R) ligand, but later found to possess higher affinity for the sigma-1 receptor (S1R). However, the putative contributions of D2R and S1R to the behavioral profile of acutely administered pridopidine have not been investigated. Objective: The present study sought to compare the effects of acute pridopidine on wild-type vs. D2R and S1R knockout mice, at high (60 mg/kg) and low (6 mg/kg) doses. Method: Pridopidine effects on basal and phencyclidine-induced locomotor activity was measured in the open field test. Additionally, the actions of pridopidine on prepulse inhibition was measured in animals treated with saline or phencyclidine. 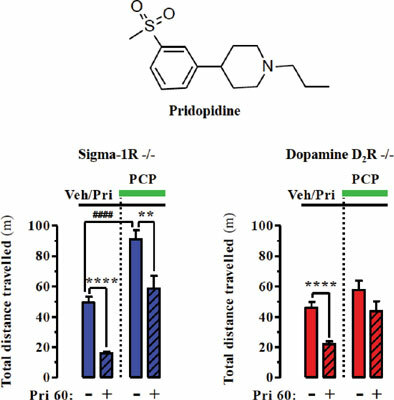 Results: Whereas inhibition of spontaneous and phencyclidine-induced locomotion was readily observed at 60 mg/kg pridopidine, neither locomotor stimulation in habituated mice, nor any effects on prepulse inhibition were detected upon pridopidine treatment. Surprisingly, inhibition of spontaneous locomotion was unaffected by both D2R and S1R deletion. Conclusion: The present results suggest the involvement of additional targets, besides D2R and S1R, in mediating locomotor inhibition by pridopidine. Keywords: Sigma-1 receptor, dopamine receptor, knockout mice, phencyclidine, open field, prepulse inhibition. Keywords:Sigma-1 receptor, dopamine receptor, knockout mice, phencyclidine, open field, prepulse inhibition. Abstract:Background: Pridopidine, a compound in clinical trials for Huntington's disease treatment, was originally synthesized as a dopamine D2 receptor (D2R) ligand, but later found to possess higher affinity for the sigma-1 receptor (S1R). However, the putative contributions of D2R and S1R to the behavioral profile of acutely administered pridopidine have not been investigated.